If you want to set your home apart this holiday season and really wow all the guests you have coming over, today is the perfect day to start your planning. 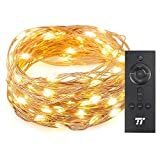 Amazon is offering a special discount on the TaoTronics 33 ft 100 LED String Lights With RF Remote Control. This beautiful strong light typically costs $13, which really isn’t a bad price at all. If you use the coupon code 9RG2LQAH at checkout though, you’ll only pay $6.99!